The moon will come closest to Earth around 1 a.m. Tuesday. If you’re up late enough Monday night, take a peek at the moon. It will be at its biggest and brightest. The moon will be closest to Earth for this orbit — a state called “perigee” — around 1 a.m. Tuesday, according to NASA. It will be the closest and brightest supermoon of 2019. The term “supermoon,” coined by astrologer Richard Nolle 40 years ago, refers to a full moon that looks bigger or brighter than usual. We’re being treated to three in a row for the first three months of the year, and February’s will be the biggest of those. “In addition, full moons during Northern Hemisphere winters tend to be brighter, because the Earth and moon are closer to the sun and because the full moon rides higher in the sky,” according to NASA. While you’re looking skyward on Monday night and early Tuesday morning, you might also be able to see some planets. “As evening twilight ends, Mars will appear in the west-southwest about 48 degrees above the horizon, (and) Mercury will appear in the west about 3 degrees above the horizon,” according to NASA. Full moon: When the side of the moon that faces Earth is fully lit by the sun. 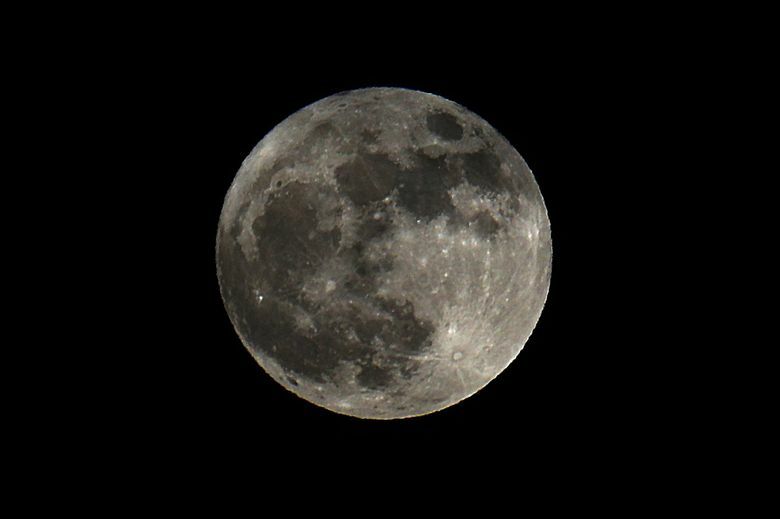 Supermoon: A full moon that appears bigger or brighter than usual because it is slightly closer to Earth. The technical term for this is a perigean full moon. Blood moon: A moon that appears red — sometimes due to smoke or haze in our air, and sometimes due to an eclipse. During a total lunar eclipse, like the one we had last month, Earth is directly between the moon and the sun, so the only light reaching the moon is from the edges of Earth’s atmosphere. Molecules in our atmosphere scatter out most of the blue light, leaving the light reflecting off the moon with a reddish tint. Blue moon: Unlike the blood moon, this isn’t about color. It refers to the second full moon in a calendar month, or the fourth full moon in a given season. Because of how lunar cycles line up with our calendar, this happens only every 2 1/2 years or so, hence the phrase “once in a blue moon” referring to a rare occurrence. Harvest moon: Not just a Neil Young song. This refers to the full moon that occurs closest to the start of autumn, allowing farmers in pre-electricity days to harvest crops by the extra moonlight. Gina Cole: gcole@seattletimes.com; on Twitter: @Gina_Cole_.